Turnstones are two bird species, the Ruddy Turnstone (Arenaria interpres), and the Black Turnstone (Arenaria melanocephala), in the family Scolopacidae. They are closely related to calidrid sandpipers (Thomas et al., 2004). Both birds are distinctive medium-sized waders. They are high Arctic breeders, and are migratory. These chunky powerful birds have strong necks and bills well suited to their feeding technique. As the name implies, these species readily turn stones or seaweed looking for hidden invertebrates. They are strictly coastal, preferring stony beaches to sand, and are often found with Purple Sandpipers. The Ruddy Turnstone (or just Turnstone in Europe) has a circumpolar distribution, and is a very long distance migrant, wintering on coasts as far south as South Africa and Australia. It is thus a common sight on coasts almost everywhere in the world. In breeding plumage, this is a showy bird, with a black-and-white head, chestnut back, white underparts and red legs. The drabber winter plumage is basically brown above and white below. This is a generally tame bird and is an opportunist feeder. Unlike most waders, it will scavenge, and has a phenomenal list of recorded food items, including human corpses and coconut. The call is a staccato "tuck- tuck- tuck". 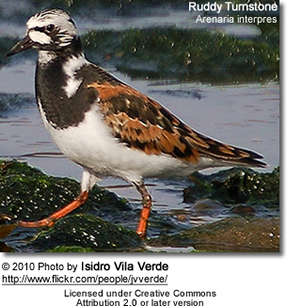 The Ruddy Turnstone is one of the species to which the Agreement on the Conservation of African-Eurasian Migratory Waterbirds (AEWA) applies. The Black Turnstone has a similar structure to its widespread relative, but has black upperparts and chest, and white below. It has a much more restricted range than the Ruddy Turnstone, breeding in western Alaska, and wintering mainly on the Pacific coast of the USA. Its habits are generally similar to Ruddy, but it has a snipe-like aerial breeding display, and a higher-pitched, more fluid call.